I sent off this red scarf and gift card the other day. I just doubled some mystery sock yarn and worked in seed stitch until I ran out of the yarn. This is such a great project. Encouragement for young people who are making good decisions is important. I think I'd like to knit more for next year. I have a few ideas for good patterns I'd like to use. I'm also making progress on my Arwen. I completed the back and have begun the left front. I ripped back my cabling as I did not care for the looks of my initial backwards loop cast on. It looks much better now. This reversible cable is lovely. I also re-wrote the charts. I wanted to make them larger and make one change. I wanted the uniformity of reading a blank square as a knit stitch and a black dot as a purl stitch no matter which side I am working. Since doing this, I'm moving along more quickly and smoothly. I also made the charts without the set-up row. Again, it is not a big change, but it just simplifies reading the chart for me. I've been getting in a bit more spinning. I'm considering trying my hand at Navajo plying. I'm going to search for videos and written instructions. I think I'll play around with my old Louet sheep head spindle. I do not love this spindle, and want to investigate why. There may be some adjustments I can make to improve it. Well, the shoulder seams to the vest are not seaming themselves. Time to get to it. Whaddya get? In my case, you get two skeins of Louet Gems in Navy. If you had some unwanted stash (full skeins with labels only, please), you could trade it in for $1/pound in credit to be spent that day at a yarn store not too far from me. It only cost me $3.13 after my credit was applied. I do believe I will receive more pleasure out of knitting these two skeins than I would have with what I brought in to the store. Most of what I traded in was not yarn I had purchased. The majority of it had been gifted to me over the years. You may have had this experience. Someone knows you knit and knows of a stash of yarn that belonged to someone somewhere. You accept the bags, sight unseen in the hopes that it will be one of those fantasy scenarios. I know I am not the only one to have these types of daydreams. Instead, it is usually a lot of easy-care, synthetic yarn that needs airing out. I have knit my share of this yarn for appropriate gifts. My niece was the recipient of several blankets and hats for her baby dolls last year, and it all came from these unexpected gifts of yarn. I have also donated multiple bags to people seeking yarn with these characteristics. In fact, I read of just such a request the other day. If they are open to receiving yarn that has lost its label or is not a full skein, I will pass on the remaining bag I had planned to trade in at the store. Otherwise, it will go back in the other room until it is needed. This adventure has helped me to organize my yarn a bit better. Elisabeth mentioned that she has a database organizing her stash. I like the idea, but I don’t quite see myself doing it. Still, I know I can better organize the stash and all it entails, and will give it more effort. Not long after I began knitting, I found the Yahoo! Group, northalabamaknitters. Intensely nervous, I found my way to one of their meetings in a conference room of a local city hall. I was warmly accepted into the group and have enjoyed knitting with them ever since. There have been a couple of changes in the meeting locations. People have come and gone. One lady who no longer attends informed us of another group organizing to knit together through Meetup. It was a bit shaky for a while there. Then the service changed and began charging fees. We moved on over to Yahoo! and became part of NAKG. We had also changed meeting times from the third Thursday to every Monday. Not many people attend both the regular NAKG meetings of the second Tuesday afternoon and fourth Friday evening at Books-A-Million and the Monday night meetings at Barnes & Noble. I attend both whenever I can. Still, we found many times when we had email messages we wanted to pass amongst the Monday night people that had little or no relevance to the regular NAKG list. One evening, I checked my email and saw the subject line of a message welcoming me to the Skanky Knit list. I thought it might be spammers and nearly did not open it. One of the Monday Night Knitters had set up a separate mailing list for us. Skanky Knit was born. I do not know if we’re truly any wilder or weirder than other knitting groups. We jokingly refer to ourselves as The Skanky Knitters. It is funny. Still, there are times when it is not easy to call them Skanks, even in jest. The group, as a whole, is special, and each individual is very dear to me. They are more important to me than they might know. I missed three knit-togethers with the Skanks last week. It was a very difficult week. It meant so much to me to receive the warm greetings and to hear that I had been missed. Truly, it was a medicine. As if that were not enough, Christina had brought me a copy of Wendy Knits. She is so sweet. She is a great wife, mom, knitter, and friend. I like to read her blog. I don’t tell anyone I know about my blog. I’m pretty sure Christina knows about it, but senses my insecurities and never mentions it. Not only did I leave Monday night with a new book, but also two skeins of Soy Silk. Elisabeth needed some dark sock yarn and I had a couple of skeins of Knitpicks Essentials in Pine. I gave them to her, and I hope they work out well for her. She asked what I wanted in return. I said that it wasn’t necessary. However, she promised to bring me some yarn. This soft, lovely yarn is what she gave me. I am blessed. Nah, I’m not going to cry about my knitting woes. However, if I need to, I am prepared. Behold, the lace-edged handkerchief I knit. The handkerchief itself originally belonged to my great-grandmother. I like this simple piece. I believe that I will knit more lace edgings on handkerchiefs. The next time I knit one I will try to work the corners differently. I have some ideas that could work. While you like viewing my lace, I know you’re most interested in my knitting sorrows. I have frustration with Mom’s vest. You knew this already. I knit through the Cream that I purchased per the pattern’s instructions. It got me through my second time knitting the little houses. I have now unraveled my swatch and am preparing that yarn to use in the vest. I hope that it will be enough to complete the vest. I still need to decrease about twenty stitches on the fronts. The decreases are meant to be worked every-other round. The math on this is simple. What baffles me is how there could be forty more rounds in the body of this vest. Is there an error? Is this just a row gauge issue? If so, what do I do? I’m considering working my decreases more frequently. I so want this to be nice. I do not like the unkind, common adjectives that keep popping into my mind when I think of this vest. Oh, great and wise Kathleen Taylor, what has gone awry? What would you suggest? If I continue to follow the pattern as written, I think it will be longer than the target twenty-three inches for the length of this vest. The largest size measures 23 ½ inches in length. The other possibility that occurs to me is that I am not getting any kind of accurate length estimation due to the drawing in of the garment because of the decreases along the various steeks. Does this make any sense? Am I just grasping at straws? I again worry about Knitpicks leading me down the wrong path as another of my Options cords has shown itself to be defective. I also believe I found another set of possible errors in this pattern, but I’m not sure. Even if I am correct on this discovery, it is only a difference of two stitches. It should not matter much. It does not matter to what I am having trouble with presently. As we return to the issue troubling me so much, I desperately seek your advice. If the problem is not an error, but rather a difference in row gauge (the pattern does not list this) between my knitting and the author’s, how would you suggest I fix this problem? Would you accept five hundred or so words? There are days I can knit for hours and not have a need to take a picture. This is not to say that I have not knit well, nor accomplished anything. It’s just how it is some days. Yesterday was one of those days. I retrieved the US 0 circular and placed it in the last correct round of the vest. Then I ripped back eight rounds and knit one round with the Cream. I set it aside for the night even though it was not as bad as I had made it in my mind. This is good. I needed something to not be as terrible as I had imagined. Something else that I had thought would only be a bit stressful turned out to be more than I had predicted. Teenager. Need I say more? This drama still has another act or two. I pray for wisdom, and I knit. Actually, the situation is not difficult because she is a teenager. That is just a complicating factor. I am so glad to not be teenaged. After the encounter with our daughter, I did the vest ripping. I thought that knitting it would be a good way to keep my mind off the situation, but I could not capture the proper mindset to work on it. 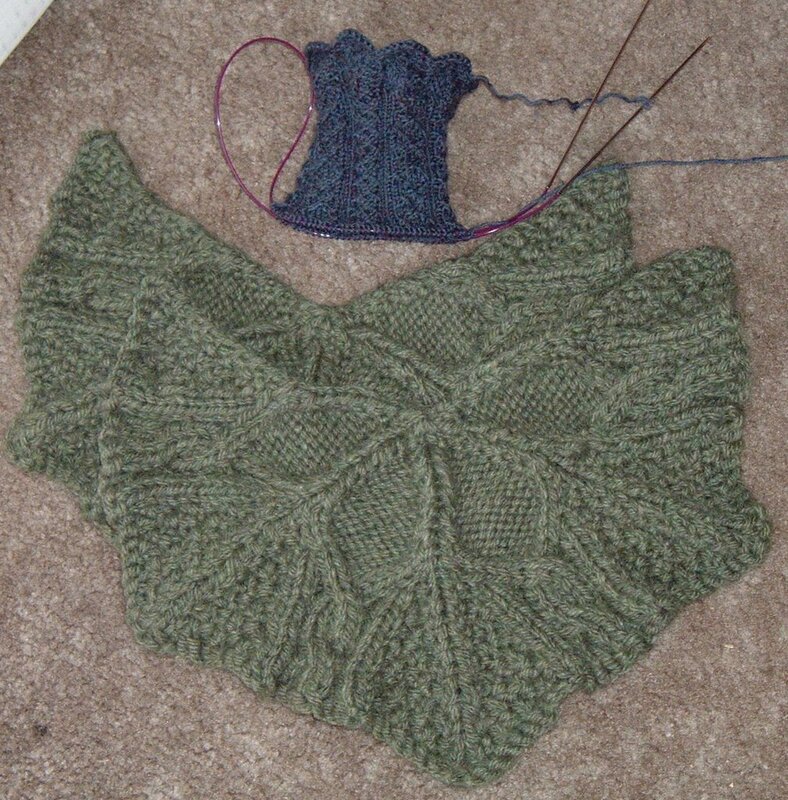 Instead, I reached for the soothing, simple stockinette of the back of Arwen, and read knit blogs. When I set aside Arwen, I could have gotten out the Brea Bag and knit on it for a while, but I knew it would lead me back to thinking about the situation with our youngster. I could have begun a square for the V-Day Community Afghan, but I did not feel like working with dishcloth cotton. I could have cast-on for the second Traveler’s Stocking, but I did not possess the requisite capacity to focus. 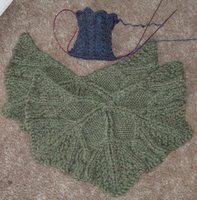 Instead, I began work on a lace-edged handkerchief. I bought the pattern quite some time ago. I’m not using the pattern. This is nothing against the pattern; however, I wanted to try something different. I got out Stahman’s Shawls and Scarves, and looked at edgings on the different shawls. I settled on Alberta. I had already worked the foundation of single crochet around the handkerchief. My plan is to knit the edging onto the handkerchief as I go instead of sewing it on later. I worked several repeats and thought it looked pretty good. Still, I had wondered whether it might be better to attach to every-other single crochet rather than to every one. I worked another repeat attaching every-other, and I liked it much better. Therefore, of course, I then had to rip out all of my work. I didn’t mind. I like a lace-edged handkerchief, and I want this to be right. This is a nice project. I like the contrast of the white cotton against the brilliant blue aluminum needles. I find it quite pleasant and soothing to just look at. Although each repeat consists of twenty rows, the stitch counts range from just three to eight stitches. It is so simple to memorize that I did not need to watch the chart for long. Yes, knitting is good. It is therapeutic. Be it the healing and comfort of wool or the magic of lace, there is power in what we do. Today, I feel stranded. I don’t quite know how I missed the mistake. I know that if you had been able to see it, you would have considered how and whether to gently inform me of the error. I sat down to knit on the vest today and as I neared the end of the round, I discovered my blunder. I blinked hard and looked again to be sure I was seeing correctly. I counted and compared knitting to chart. I carefully examined to see if it was something I could duplicate stitch or somehow otherwise fix without ripping back eight rounds. It is not. The problem is with the little houses you couldn’t see in the picture the other day. 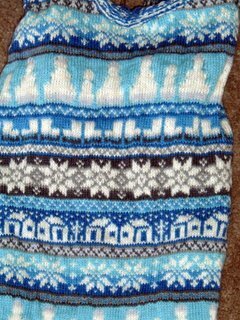 Even if I had uncurled the top of the knitting so you could see the houses, the error would not have been visible because it was on the other side of the vest. I’m not looking forward to this, but rip I will rip back. However, I will wait to do this until after I’ve gotten a decent night’s sleep. I didn’t catch much shuteye last night. Isn’t that something? It was when I was bleary-eyed and tired that I found the error. I’ve knit four fuzzy, furry hats for the kids. They don’t take long to knit. I get the feeling of accomplishment from completing the caps and the nice feeling that comes from helping others. I know that I will feel good when I can finally give Mom her sweater, but I’m trying to stay relaxed about that. I still have been unable to accept my invite to the Arwen knitalong. Blogger is having difficulties. Truth be told, there isn’t much to show on the cardigan. I’ve passed the hem and have knit it together with the body. It isn’t much to look at, but I already love it. Straight stockinette for another seventeen inches or so appeals to me right now. Of course, I’m looking forward to the cabling on the fronts. The weather is turning back into winter here, so I know that I will have a longing to wear this soon. Still, it is also nice to knit along on a wooly project while the temperature drops. I can focus on that pleasant feeling as I rip back the vest and knit it again. Yes, that sounds like a plan. I swatched for Arwen. I knit four chemo caps. I began Traveler’s Stockings. I knit the back and front of my daughter’s purse. I put in some quality time with the drop spindle. I needed to do all of these things to return to the challenge. Yes, I can now go back to knitting Mom’s vest. I had just become so frustrated that I had to give it a break. I really have made a lot of progress on it since you’ve seen it last. How about a peak? There you go. It curled at the top and you cannot see that I'm halfway through another repeat of the little houses. I’m closing in on finishing the body of the vest. If I need to buy more of the Cream, Knit Picks says that they will waive the shipping fees. I cannot say that I’ve regained my enthusiasm for the project, but I no longer dread it. I will get excited again when I am closer to finishing it. Of course, Stranded is not my only challenge. I have again enrolled in Discovery Health’s National Body Challenge. It kicks off this weekend. 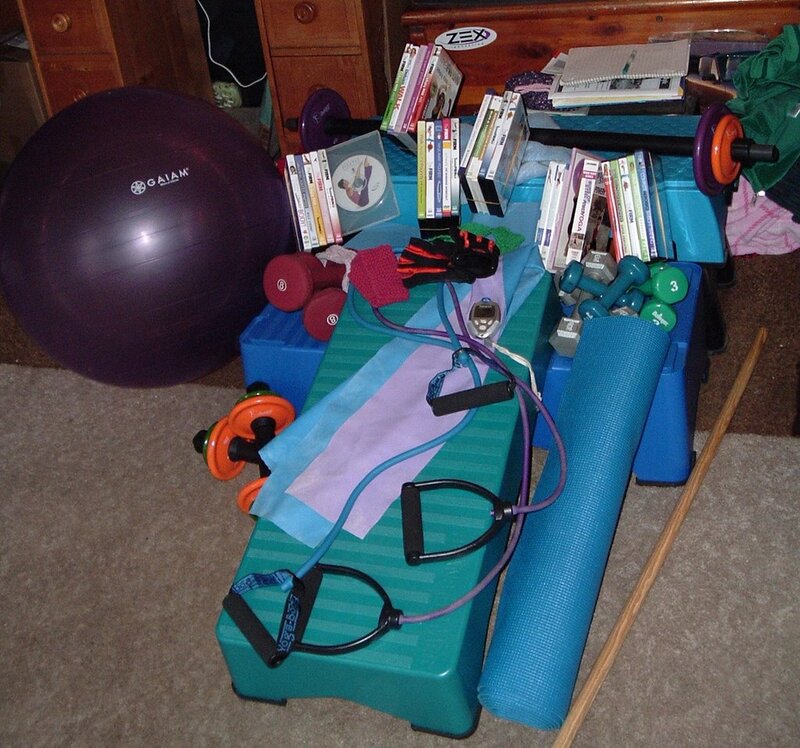 Seeing as how this is the beginning of the National Body Challenge, this seems like the right time to post a picture of my exercise space. Rather than showing you my living room where I workout, I decided to share a picture of my exercise stuff. I have been an in-home exerciser for a few years now. This is what works best for me, and it is what I have been able to stick with. I put in a dvd and get moving. It does not matter what the weather is like outside. It does not matter what time it is. I don’t have to worry about bugs, animals, or traveling time and traffic to a suitable destination. I can don whatever attire is best suited to exercising without concern to how it will impact others. When I’m done, I can peel off my sweaty clothes and head straight to my own shower. I can choose from a variety of workouts just by pulling a different dvd from the shelf. I can make a big change to my routine with a modest investment in a new dvd. Like I say, I still don’t love working out, but I can do this. The best exercise is the one you’ll do. Since I’m committing myself (shhh, be nice) to challenges left and right, how about one more? I will go 100 miles by April 1st. 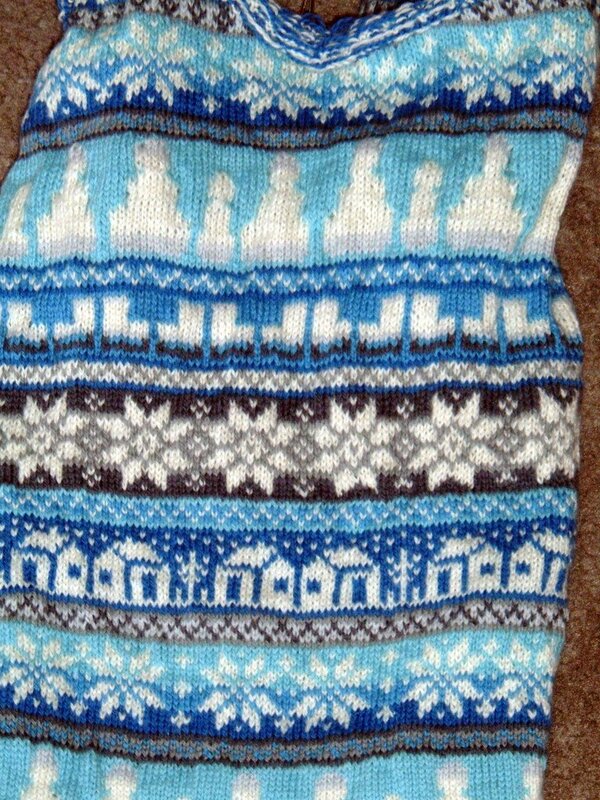 I wanted to knit this from the first time I saw it. I received the yarn for Christmas. I'm using Knit Picks Wool of the Andes in the color Hyacinth. I've seriously swatched. My first attempt was not to gauge. My second try looked much more promising, so I washed and treated the swatch as I will the finished garment. Much to my delight, I have gauge. Next step, is casting on for the back. I'm considering knitting this without the hood. I don't yet know how I would make this work, or if it would work. Suggestions, anyone? Today was an NAKG Tuesday afternoon knit together. I was showing my yarn for this project when one of the Monday Night Skanky gals asked what weigh the pattern requires. It seems my incessant yammering can be positive sometimes, and I may have company knitting this beautiful cardigan. This is an anomaly. I will try to not let it go to my head, nor detract from the fact that my run-on mouth is usually a source for trouble. Besides the prospect of companionship on this project, I am also excited because Margaret is a genius at knitting and changing garments. She would probably be able to see how I need to make the changes to Arwen that I would like to make. Time to cast-on! Was your Distaff Day delightful? Did you have a rockin’ Roc Day? I managed to get in a few minutes of spinning. My copy of The Twisted Sisters Sock Workbook is due to arrive tomorrow. I am excited. I’m also getting The Knitter’s Almanac. Can you believe that this is my first EZ book? I checked Knitting Without Tears from the library when I first began knitting, and found it very helpful and interesting. Perhaps one day I will have my own copy. In the meantime, it has been Caps for a Cure knitting all the time here. I need to send off the five I have completed. Two more need to dry before I can get them in the mail. I also need to attach the tags. No pictures this time. Christmas knitting got in the way, and I got behind. Speaking of knitting the chemo caps, have you seen this? I’m gathering up the Fun Fur and its cousins and knitting some of these. If I run out of what I have and there’s time, I may look for donations. I’ve knit chemo caps from the eyelash yarn before for Caps for a Cure. They’re fun, easy, and quick. C’mon, it’s for a good cause.